My cupcake prayers in Scarborough have been answered! Over the past two years, I’ve been hitting up as many cupcakeries and bake shops with cupcakes as possible (and going back numerous times to some because I love them so dearly!) and I’m still far from knocking ’em all off my list – and those are the ones I’m aware of! There are plenty of other cupcake fairy lands that I probably don’t even know about and that’s where Sugarbuds Bakery & Café comes in. After visiting and finding out about cupcake shops downtown, uptown, in the west end, in North York, and in Markham, I wondered to myself, “are there any cupcake shops in Scarborough?” Some people might write off the suburbs and not give downtown’s surrounding areas a second thought (or any thought at all), but there is some darn good food in these neighbourhoods. After living in the suburbs all my life with the exception of my first year and half, I know particular areas so well I could easily walk around blindfolded and find my way out and about without a problem. There are always hidden pockets though, or in my case, unchartered territorities. When I’m referring to Scarborough here, I’m talking about “outskirts-almost-bordering-Port Union” Scarborough. And yes, there are cupcakes. Introducing Sugarbuds Bakery & Café on Old Kingston Road! I have Groupon to thank for this one. Even though I didn’t end up purchasing this particular deal, I was so taken aback and delighted by it that I saved it in my inbox. It was too good of a finding to pass up! 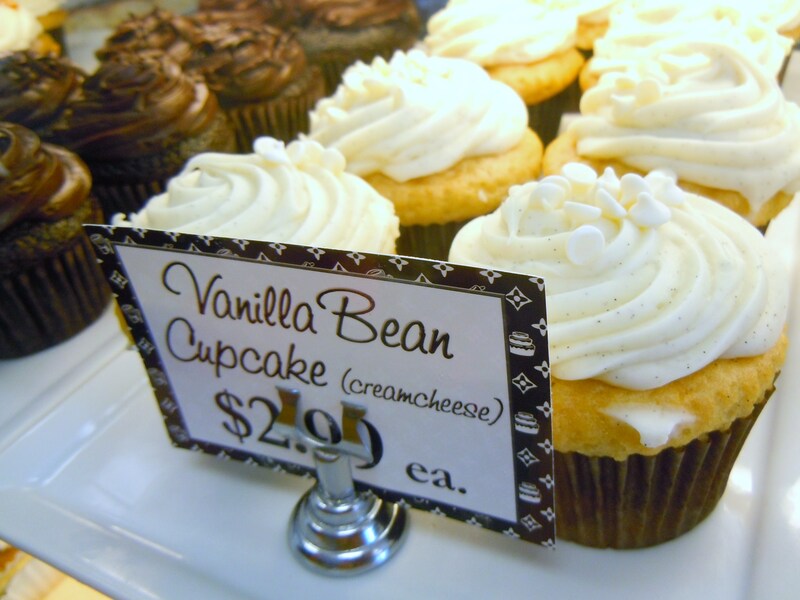 Finally, I found out about a cupcake place and bake shop in Scarborough! I couldn’t wait to go. I was so excited I actually called them to make sure they would have cupcakes available in the shop. I didn’t want to take any chances. 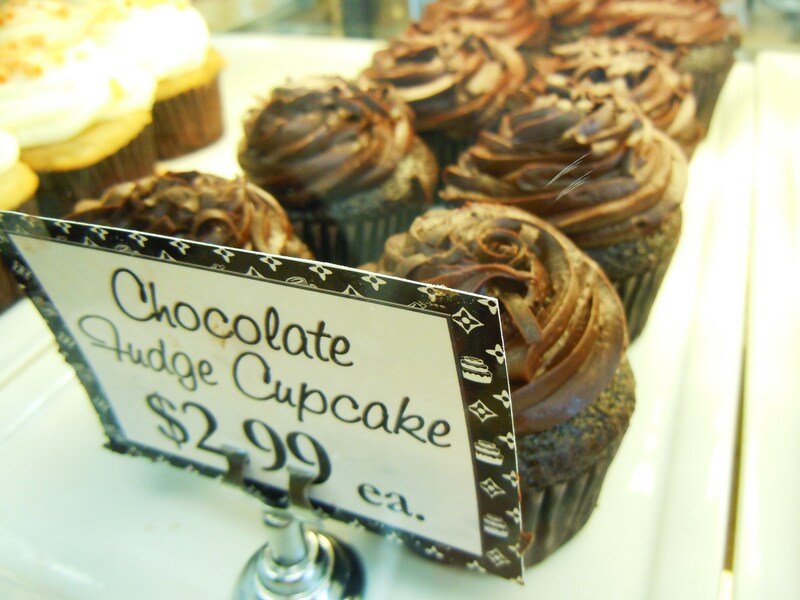 For all I knew, cupcakes might have been sold on a “by order only” basis. I was in luck though: cupcakes were available every day in different flavours and ready to be devoured by me. 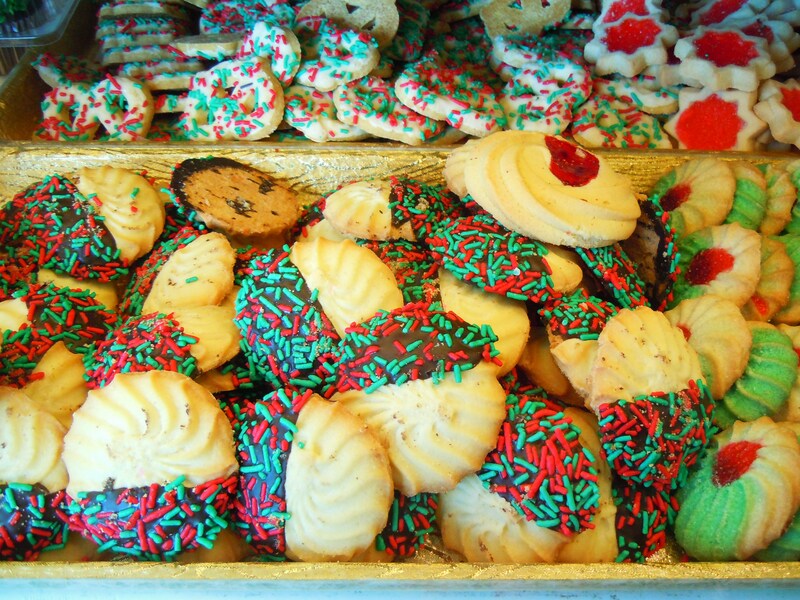 After jotting down directions from a map, I made my way over with my beloved boyfriend and prepared myself for some holiday sweet sights and treats. Were we ever treated to a show! 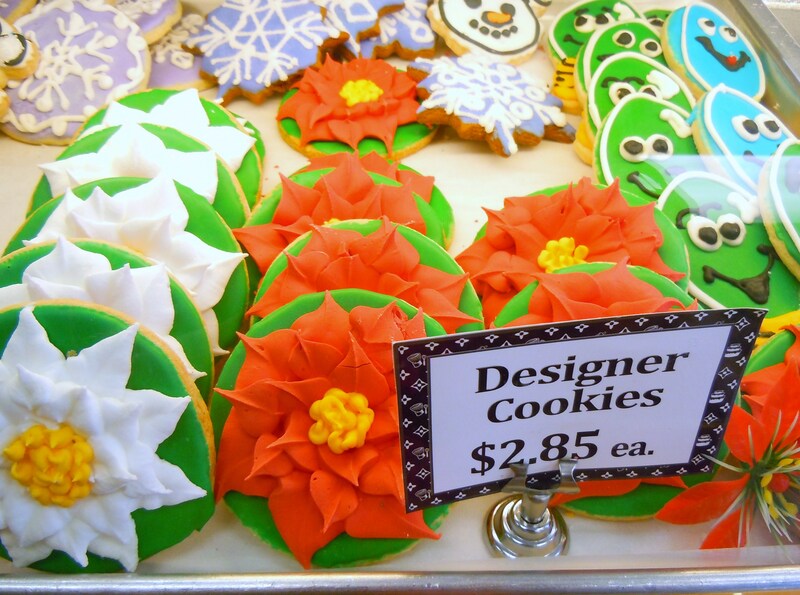 This bakery and café is fabulous! Not only is it accessible by bus (always a plus in my book), but there are tables and chairs for you to sit down and enjoy your treats, and there are tons of dessert options and savoury options! You could realistically sit down for some lunch and dessert here as they serve meat pies, soups, savoury pastries, coffee drinks, and more. The bakery is split up into two parts and you’ll find the seating, savoury food, and giant class display cases with many of their desserts in the larger portion of the shop in the back, while the front end takes care of some of the retail goodies that the shop sells, such as gift baskets, as well as another assortment of baked goods including decorated cookies. 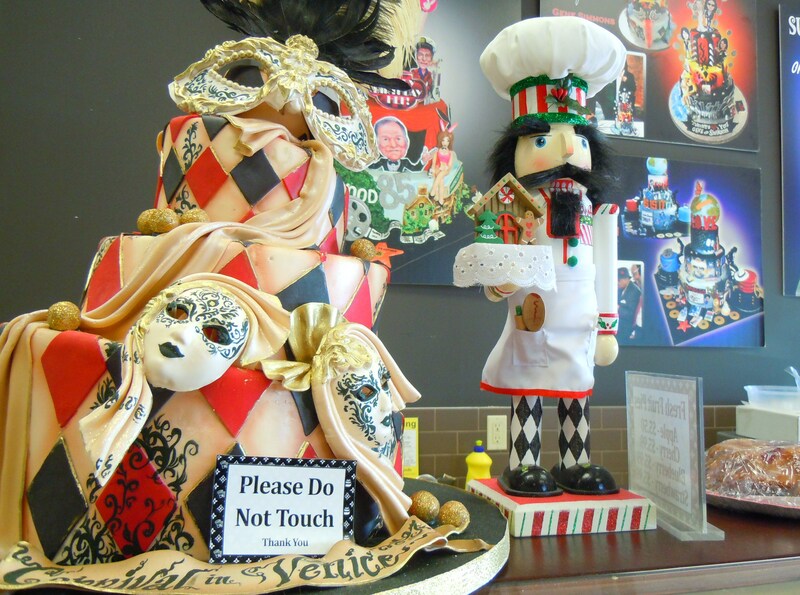 Sugarbuds specializes in customized cakes for special occasions (think wedding cakes, giant birthday cakes, cakes for showers, themed parties, and more) and has the celebrity seal of approval on their website from hosting and catering special events! 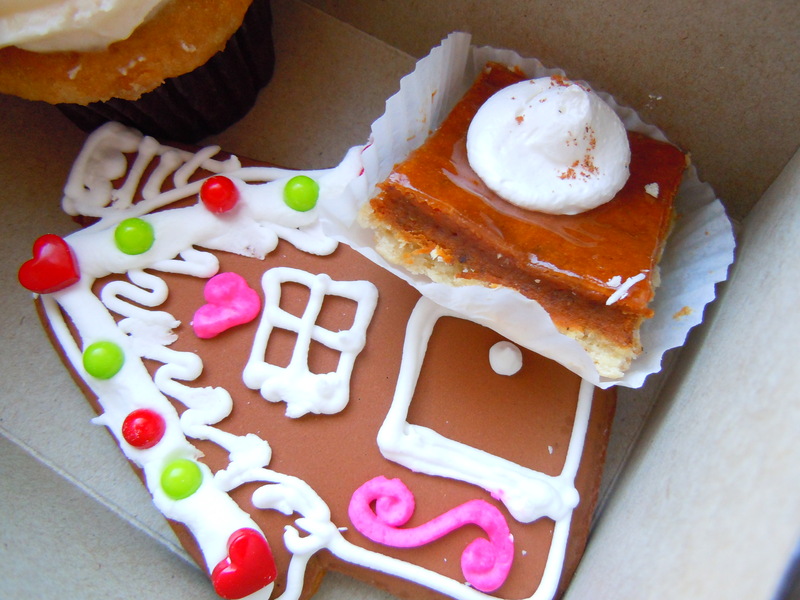 In addition, they make beautiful gingerbread houses, and sell everything from eclairs to pumpkin pie squares to cupcakes to sugar cookies to RAINBOW CAKE! Yes, that’s right, you can get rainbow cake here! Remember the famous rainbow cake from Wanda’s Pie in the Sky? Sugarbuds has an amazing version that you just have to get your hands and sweet teeth on! I need to get my sweet teeth in it. This fabulousity that I speak of comes straight from my boyfriend who told me he regretted not getting FIVE slices because the one he ate was all sorts of awesome. I know, FIVE! I think he threw that number out there just to make a point, but I’ll take his word for it because I really don’t want to see him eat five slices! As much as we hate to, we need to set limits. A cupcake ($2.99) was a no brainer (they had 4 available: vanilla bean cream cheese, chocolate fudge, red velvet, and bananas foster, along with some Christmas cupcakes), but I wanted to take away something else. I hemmed and hawwed so long I let another lady go in front of me to order first. I finally settled on a bananas foster cupcake, a pumpkin pie square with the dollop of whipped cream, and a pink, red, white, and green iced and decorated gingerbread house cookie. The desserts here are fantastic. 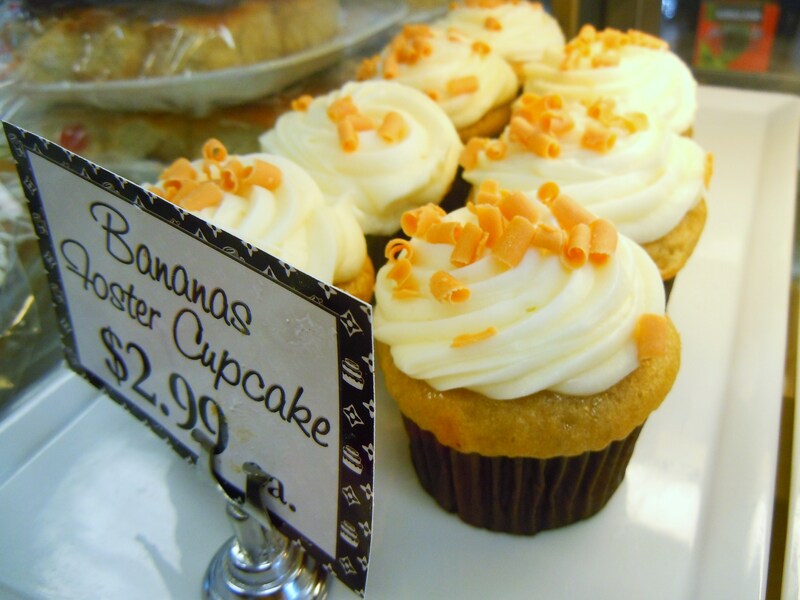 My boyfriend, who is one of the pickiest eaters I know, loved his desserts to death (his rainbow cake slice and his gingerbread house cookie) and I gorged on my bananas foster cupcake like there was no tomorrow. It was the strangest thing because the cake itself wasn’t dense (the way you’d envision fruit cake to be), but the flavour was deliciously dense. I loved the texture and flavour of the cake. It was like a power punch of banana with an almost fudgy sort of texture. The cake wasn’t crumby or pillowy. If I had to compare it to something, I’d say the cake was like a banana brownie! It was delicous and different and OH SO GOOD. The frosting was pure, straight up vanilla (and quite like vanilla ice cream in flavour, much like an actual bananas foster dessert) and the cupcake was adorned with caramel butterscotch curls. I’m so happy I found out about Sugarbuds. 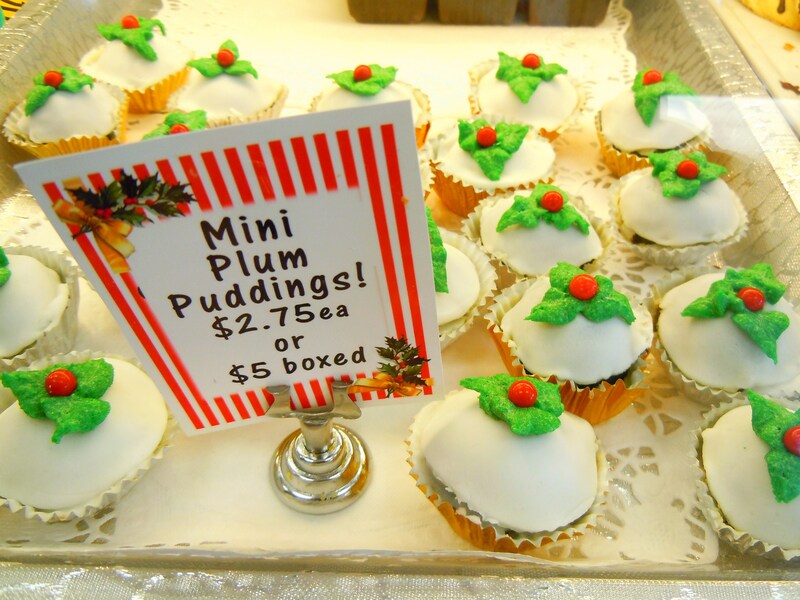 Now that I know they exist, I can make future visits and enjoy other seasonal delectables (Valentine’s, anyone?) in the future. I know not everyone sees the value in web enterprises such as Groupon or even agrees with the premise of it, but for me, it really has helped me find out about businesses I never would have known about and for that I’m grateful. 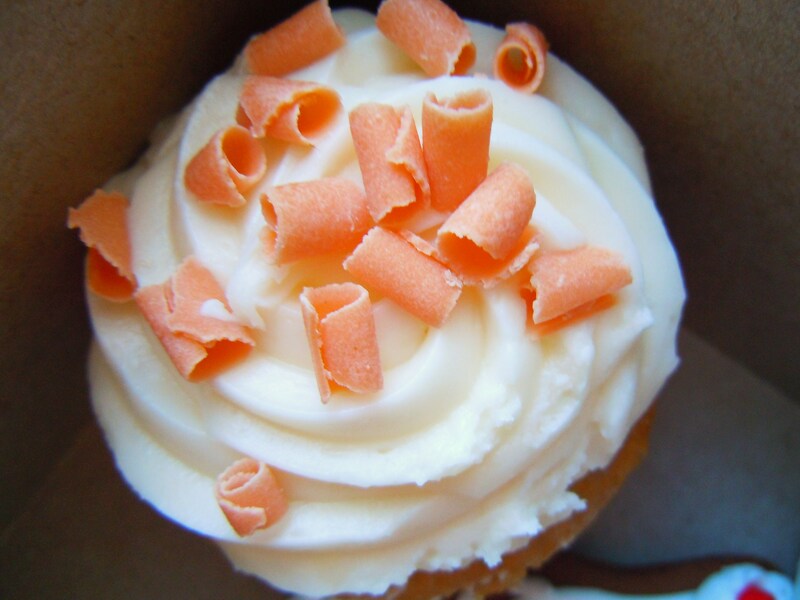 Here’s to cupcakes in Scarborough! 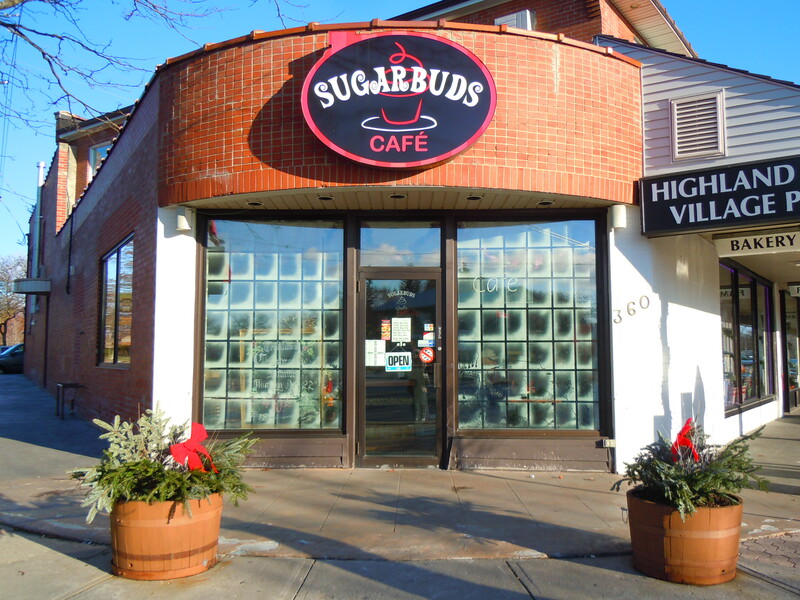 Sugarbuds Bakery & Café is located at 360 Old Kingston Road, right at the corner of Old Kingston and Morrish Rd. by the eastern boundary of Scarborough in Highland Creek. The 38 TTC bus will take you right there as it travels east from Scarborough Town Centre to Rouge Hill GO station. If you’re driving, the easiest way to get there, in my opinion, is to drive south on Morningside, swing east when you get to Ellesmere, and go south on Morrish Rd. until you get to Old Kingston Rd.